In June of 2007, Paws Pet Resort & Spa opened its doors to begin offering overnight boarding, daycare, and salon services for dogs, cats and other domestic animals. Located just 1/2 mile from Route 10 and 1 mile from I-691, Paws Pet Resort & Spa wanted to provide a convenient option for those living in the Cheshire, CT and the surrounding area looking for a trusted, safe resort to keep their pet. We are animals lovers who believe every pet should be treated like family. We provide the best luxury pet care services in Cheshire, CT. and have even been featured on Better Connecticut’s Channel 3 news and Connecticut’s Channel 8 news. 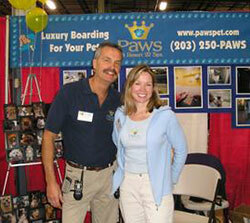 At Paws Pet Resort, we have a variety of services and accommodations to fit the individual needs of your pets. From our spacious luxury suites to our Mini-Mansions and even our multi-room suites, are all fit for a King and come complete with plush bedding, Cable TV, radiant heated floors, and the highest quality love and care from our staff. Your dog will jump for joy in our indoor 4,000 square foot canine gymnasium, or in one of the outdoor play yards during supervised playtime in groups or on an individual basis. The entire facility is air conditioned and heated with relaxing music played throughout. Yappy hour takes place every day at Paws Pet Resort & Spa where pets may choose from a menu of snacks including gourmet pawstries, Frosty Paw or Pralines frozen doggie treats. And let’s not forget about our feline friends! Cats enjoy spacious two-level condos in a separate cattery made especially for them. They can lounge on the sunny windowsill, play on a six-foot cat tree, or watch kitty videos made especially for them. 1 mile off exit 3 on I-691 and ½ mile from Route 10. Please call for more information (203) 250-7297 or stop by for a tour.